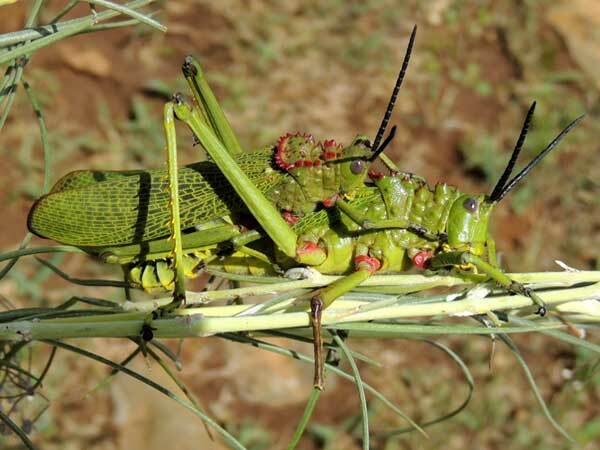 This grasshopper pair (male on top) was observed feeding on Gomphocarpus, Asclepiadaceae, west of Eldoret, Kenya. April 2013. Grasshoppers are mostly agile insects that are wary and ready to jump or fly at the least hint of danger. Gaudy Grasshoppers abandoned this strategy for avoiding being eaten by instead sequestering noxious chemicals from their food plants in combination with tough and often sharp body amourmants. This species feeds on toxic milkweed that livestock won't browse. An insectivore that ignores the warning coloration will get a mouthfull of unpleasant chemical and will maybe release the insect altogether.